Data collection for Galaxy Zoo Mergers is closed. 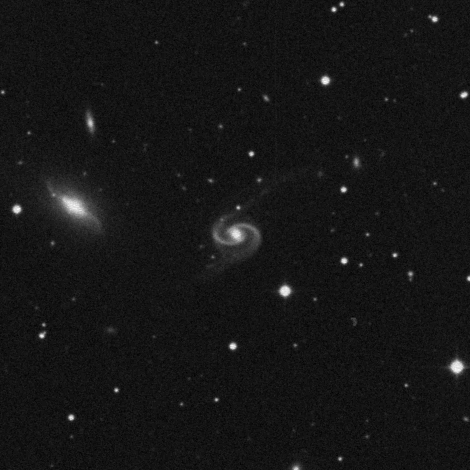 Arp 65 (NGC 90/93) features one galaxy with long but asymmetric tails and another nearly edge-on with a bulge. Select simulations that look similar to the targeted merger. Take your best matches, and improve them by tuning your simulations. Find the best of the best from your set of possible matches. You decide which simulation wins in a series of tournament-style competitions. The more competitions a simulation wins, the more likely it is the best match. Visit our Gallery of results to see what our volunteers have contributed. The initial results are already showing some promising matches.